The persecution of Falun Gong practitioners in China by the Chinese Communist Party (CCP) has lasted 12 years since it started on July 20, 1999. 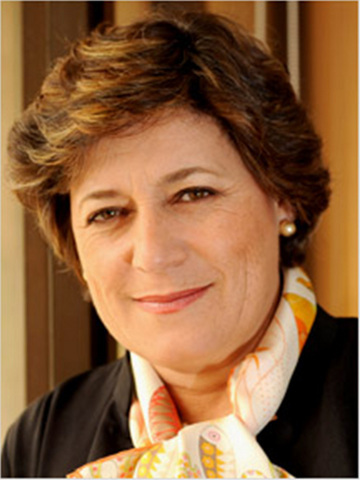 On July 20, Members of the European Parliament, Zuzana Roithova and Ana Gomes, wrote letters to Falun Gong practitioners to condemn the CCP's persecution and express their support to Falun Gong practitioners. Thank you for inviting me to write this letter for you, in regard to July 20th, 2011, as the 12th anniversary of the beginning of the persecution of Falun Gong practitioners by the Chinese government. As we know, on July 20th 1999, the Chinese government initiated the persecution of Falun Gong – unparalleled in its severity in recent times. In response, Falun Gong practitioners have maintained a quiet heroism in exerting a peaceful and comprehensive anti persecution campaign until the present time. Today practitioners of Falun Gong are standing together with the citizens of China, calling on the communist regime to end its oppressive ways. I esteem your efforts and wish you to persist in continuing your fight toward freedom! Given the proximity of the 20th anniversary of the Falun Gong movement, I wish to convey my recognition and encouragement to all the practitioners of the Falun Gong in China who have stood up and continue to stand up against the crackdown and harassment perpetrated by the Chinese authorities. I am a great admirer of the Chinese people and its millenary civilization and culture. I also admire the last decades of economic progress that China has known, liberating thousands of millions of human beings from misery. I believe that the Falun Gong movement has inherited its strength from the long tradition of the Chinese people’s resistance to oppression and injustice. Article 18 of the Universal Declaration of Human Rights protects the freedom of thought, conscience and religion. The People’s Republic of China, as a Member of the UN Security Council, has special obligations to respect human rights under the United Nations Charter. Unfortunately though, the persecution against Falun Gong practitioners is an example of the Chinese undemocratic regime and its poor human rights record. The Falun Gong movement in any democratic society is recognized as a legitimate one, a movement which lays its right to exist on the freedom of thought, practice and assembly, one that does not propagate hate, violence or instability. It is, therefore, with great concern that I have heard of the continuous attempts of suppression of the Falun Gong in China, through violent repression – killings, torture, and imprisonment – as a way of curbing the Falun Gong’s independence, popularity and ethical values. 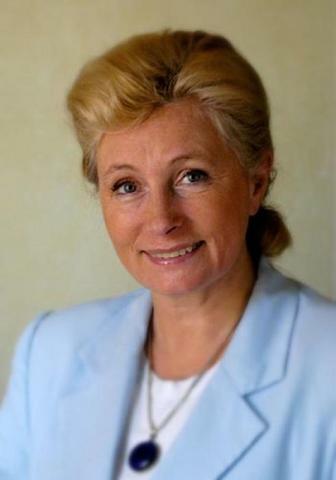 I stand in support for the Falun Gong followers’ struggle to survive and fight for their basic human rights and I admire the courage of all those who, since 1999, have complained, sued, demonstrated and spoken out against the repression, despite the terrible repercussions of these actions on their lives. 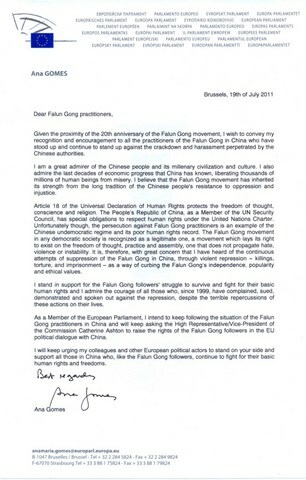 As a Member of the European Parliament, I intend to keep following the situation of the Falun Gong practitioners in China and will keep asking the High Representative/Vice-President of the Commission Catherine Ashton to raise the rights of the Falun Gong followers in the EU political dialogue with China. I will keep urging my colleagues and other European political actors to stand on your side and support all those in China who, like the Falun Gong followers, continue to fight for their basic human rights and freedoms.